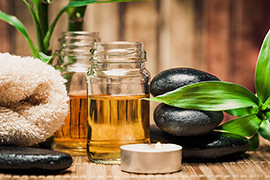 This is the first Thai massage service in the Zachodniopomorskie Voivodeship which only employs only experienced masseuses from Thailand who have completed courses and gained many years of experience as they provided massage services in various regions of the world. Our personnel were trained in the Wat Pho temple in Bangkok. 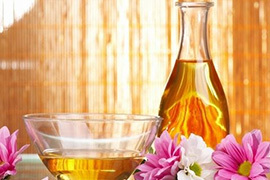 Warming ointment, aroma oils, balms and herbal compresses used in Royal Thai Massage undergo constant monitoring and quality checks by industry experts. We hope that our services will restore your body’s harmony - unlocking the energy flow by having a positive impact on blood and lymph circulation, strengthening the immune system as well as relaxing muscles and improving mobility. We guarantee you total relaxation in the first class lounge which, with its authentic oriental décor, will take you to the true Thailand. Thai massage combines cultural elements from China, India and other countries from the Southern Asian corner of the world. The legendary doctor of Buddha (500 BC), Shivago Komarpaja is believed to have created the massage. The art of massage includes knowledge from the various corners of Siam, hence the different styles of massage depending on the masseuse's country of origin. The Royal Massage Academy in Chiang Mai, which is known for its many centuries of massage tradition, is recognised as the best school of Thai massage. The whole philosophy of Thai massage according to the Thai people, is that the human body is filled with particles of air that people inhale and transmit to channels called Sen. Their concentration starts in the navel and ends on the lips. The main job of a masseuse is to focus on given body parts a pressure and stretching technique. Thai massage is also known as "the lazy man's yoga" because the position of the body and stretching correspond to yoga positions - it is a dry procedure (no oil) performed with light, loose clothing on a mattress on the floor. It combines very slow & rhythmic pressure on muscles to relax them, and then stretching the muscles to increase the range of movement. 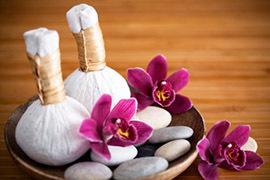 Masseuses use not only fingers but also forearms or even elbows, feet and knees. If you are in a good physical condition, your therapist may literally walk on you, balancing while holding onto a line hanging down from the ceiling. 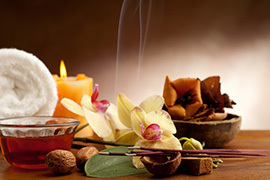 Thai massage lets you improve your physical, spiritual and intellectual condition. Such a method makes the energy flow through the patient's body easier. Additionally, the masseuse uses techniques consisting of stretching, blood flow stimulation, working with the energy and relaxation channels depending on the patient's needs. It is a type of massage which definitely differs from others. 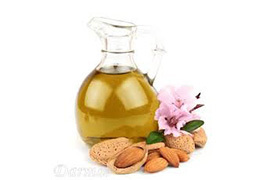 Its effects on the body are based on treatment. It combines elements of yoga, acupressure, reflexology and meditation. 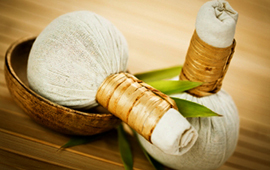 The classic Thai massage lasts about 2 hours (depending on the patient's body weight). This massage is similar to the classic one, but the masseuse focuses mainly on the aching spine to eliminate or largely alleviate the discomfort. The massage also has a soothing and relaxing effect. It is especially recommended to people performing work that puts a lot of strain on the spine. 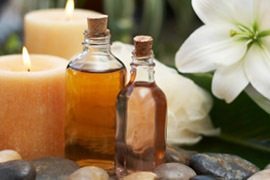 This is similar to the classic body massage, but has an appropriate character depending on the different types of oils. Some are relaxing while other ones are stimulating. This is performed with specially prepared stamps containing herbs and spices. It may be compared to a massage in a sauna and to a massage with stones. Stamps are warmed for a few minuteses in a steamer to release the essential oils included in the herbs, then the body is massaged with them. At the beginning, when the stamps are very hot, the massage takes the form of short touches on certain places on the body. After that the stamps are pressed against the body. Afterwards, as the stamps get colder, the massage becomes more intense which makes the active substances contained in the herbs release and become absorbed in the warmed skin. 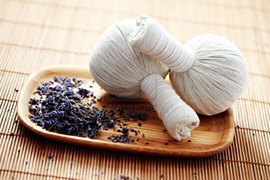 Due to the temperature used, the herb massage improves circulation and stimulates the healing of contusions. As it is a rather intense massage for both the customer and the therapist, we offer it in form of 30 and 45 minuteses, but a rest of 15-30 minuteses is recommended. Performed with a special short oval stick, it is a ritual that begins with the application of warm lotions, a delicate relaxation of foot and calf muscles, wrapping them in warm towels, and then massaging the feet. It is a procedure for brave people. The pain felt should be within the limits of your tolerance, and the therapist will expect you to continuously confirm that you are still feeling comfortable. The foot massage is based on the principle of reflexology; hence it is an intense stimulation for the entire body, so the procedure may last 30 minuteses at the most. A longer massage may stimulate the nervous system too much and cause unpleasant sensations. The foot massage may be combined with a classic Thai massage - the procedures complement and suit one another well. according to the Thai people, is that the human body is filled with particles of air that people inhale and transmit to channels called Sen.
Visit our lounge and let our exceptional masseuses take care of you. Make an appointment online or call the number +48 660 530 830. Please, feel free to purchase invitations for a person selected by you for an individual massage (classic, sports, relaxing massages). These invitations are available at the reception desk of Royal Thai Massage.